In 1930, the ruler of the then princely state of Tripura commissioned the British company Martin and Burns to construct a summer resort for him. The Maharaja got his palace nine years later: in the middle of a lake. It was aptly called Neermahal--water palace. Situated at Melaghar in West Tripura district, this magnificent palace at the centre of Rudrasagar lake is today a popular tourist destination. But unfortunately it is also in a dilapidated state. Human activities around the Rudrasagar Lake in the past 50 years have almost put paid to the water body. Experts say the lake has shrunk by more than 40 per cent in the last half a century. "Heavy siltation and pollution from the six brick kilns nearby have made Rudrasagar a pale shadow of its former self, and the palace is in disrepair" says Jiten Paul, the head of Mukta Mancha, an association of Tripura's intellectuals. He believes that Rudrasagar is showing the effects of population growth in its adjoining areas. Eighty three-year-old Kanu Dey, whose father was a palace employee elaborates, "There were only 12 families living in the vicinity of the lake when Martin and Burn handed over the palace to the maharaja. Today more than 200,000 people are dependant on the lake." Many residents like Rahul Das believe "the deterioration of the lake began with the influx from erstwhile East Pakistan (Bangladesh) in 1951". The rapid growth of settlements and extension of agricultural activities played a vital role in the shrinking of the lake. "More than half of Rudrasagar has been taken up for agricultural activities," says Paul. Other experts say that soil erosion due to deforestation in the catchment area of the lake has caused massive siltation. Rudrasagar is a confluence of the Noachhara, Kemtalichhara and Durlavnarayanchhara--tributaries of state's major river Gumati. Environmentalists say that more water-harvesting structures in Gumati's catchment area could revive Rudrasagar. They believe the lake has not received its due as a site featuring in the Ramsar list of important wetlands. Tripura's tourism department also believes that the lake and the monument deserve protection. 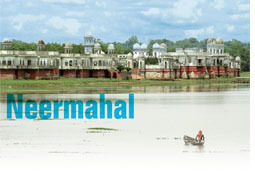 "After all more than three lakh people visit Neermahal every year," says Tripura's tourism minister, Anil Sarkar. But those dependent on the lake have their demands as well. "More than 40,000 families earn their livelihoods by catching fish from the lake and cultivating the surrounding lands. Nothing should be done to jeopardize their source of income. We might be settlers, but we have got Indian citizenship by domicile," says Manaranjan Barman, a leader of the fishing community of Rudrasagar. He says that the annual revenue from fishing in the lake is about Rs 25 lakh. Environmentalist Sumanta Chakraborty says that "conservation plans for Rudrasagar and Neermahal should be made after considering the types of uses people draw out of the water body". "The plans should accord adequate importance to food production activities (including pisciulture), improvement of wastewater quality, groundwater recharge, flood control and wildlife conservation, including habitat for fish spawning," he adds. Chakraborty believes that agriculture can go on without disturbing the eco-cycle, if farmers use biofertilizers.